Two extremely important and contradictory events have happened in the space of just 7 days - one in the UK, one in the US. One is great news for vapers, the other potentially disastrous. Critically, this regulation effectively requires all e-cigarettes and vaping products to complete a Pre-Market Tobacco Application (PMTA) in order to remain on the market (they will have 2 years from August to do so). It’s an enormously onerous and expensive regulatory process – The FDA has estimated a cost of $330k per product and 1,500 hours work, per application. This is likely to be an under-estimate, but even taking these numbers, for a company with 5 products, each with 4 nicotine strengths and 5 flavours, that's $33m and 150,000 hours of work (equivalent to 19 people working for 1 year). Companies will have to provide evidence not only of each product’s vapour content and its effect on the individual, but also its population impact – on smokers' quitting benviour and on non-smokers (a tall order with a regulator who believes e-cigarettes are addicting youth). This will be all but impossible for the new generation products sold as different components, with different nicotine strengths and flavours for e-juice (capabable of use with many different devices) and vaporising devices with variable wattage and coil resistance (capable of use with any e-liquid). The problem is, consumer behaviour tells us that these are the most effective products when it comes to replacing smoking. Ironically, products that were on the market as of Feb 17, 2007 (ie the vast majority of current cigarette products, all much more dangerous than e-cigarettes), get a free pass. And the few companies with the wherewithal to navigate the PMTA? The tobacco companies plus a couple of the very largest independent manufacturers. — Nicotine without smoke: tobacco harm reduction. Renormalisation of smoking – regular vaping is limited almost exclusively to current or ex-smokers and there is no evidence of any appreciable degree of re-normalisation of smoking in adults or children. Gateway effect - again, the vast majority of experimentation and vitually all regular use, is among those who smoke or used to smoke. Any gateway effect is likely to be out of smoking rather than into it. There has indeed been a significant decline in cigarette use (the most deadly form of nicotine) – in adults and particularly among children, to historically low levels. And if anything, that rate of decline has accelerated in the last few years since the emergence of vaping. Of course you can’t conclude that vaping has driven that acceleration, but it is possible and there’s absolutely no evidence that the emergence of e-cigarettes has slowed it. Taken from Clive Bates' blog "Professor Glantz brings his anti-vaping crusade to Europe - I review his presentation". It's clear that 1) the majority of 'current use' is for less than 5/30 days; and 2) the percentage of use >20 days / month is much higher for cigarettes than e-cigarettes. And yet all of these data are conflated in eg CDC and FDA press releases to create a quite misleading picture. 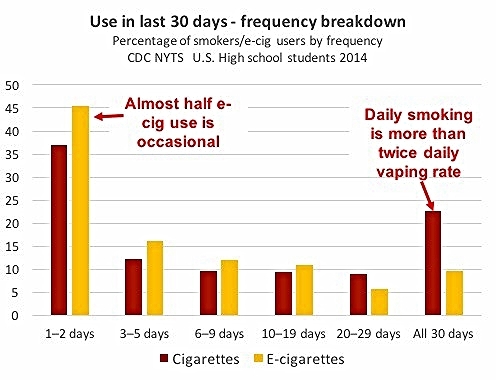 16% of high school students “currently use” e-cigarettes - defined as having used at least once in the last 30 days. But this doesn't equate to regular use as you or I would understand it. About half of these people state have used e-cigarettes for just one or two days out of the last 30 - I wouldn't call that regular. Of these 'current users', around 90% have previously used or currently use cigarettes. And according to the other major survey in the US, the Monitoring the Future (MTF) survey, 60% of high school students who reported using e-cigarettes said they had vaped nicotine-free e-juice. So the proportion of students who are truly regular vapers of nicotine, who've never smoked before, is WAY lower than 16% (NB - data from the UK suggest it's close to zero). So how do we make sense of the FDA approach? The first thing, as usual in the US, is to understand the legal context. Having battled for years to gain regulatory control over tobacco, in 2009 Congress created the Family Prevention and Tobacco Control Act (known as the Tobacco Control Act or TCA). In light of the previous “lights” scandal, this was specifically designed to prevent the tobacco industry bringing to market so-called “reduced risk” tobacco products by introducing a prohibitively high regulatory hurdle. The FDA originally wanted to regulate e-cigarettes as medicines (which would have killed off the market earlier), but were defeated in the courts in 2010. So, in 2014 they “deemed” e-cigarettes to be tobacco products, which means they are now legally tied by the TCA in terms of what they can do (remember, it was designed to stop new products coming to market). For more on this legal context, see this excellent blog by Clive Bates, ex-Director of ASH and pro-THR activist. A second fundamental factor is the historical culture / ideology towards harm reduction as a concept. And this shows itself in the different lenses through which the RCP and FDA press releases view the situation. The FDA is clearly focused on protecting non-smokers, especially youth, and have adopted an absolutist strategy aimed at eliminating nicotine addiction. But the RCP has dismissed the risk of never smoking children becoming regular vapers - in the 2014 'What About YOUth' survey of 120,000 English 15 year-olds, while 13% had tried e-cigarettes, 0% (yes, you read that correctly) were regular users. As such, the RCP's focus is on current smokers – with a pragmatic harm reduction strategy aimed at reducing tobacco related death and disease. As explained in an article by Dr Amy Fairchild in NEJM, and an excellent lecture given recently by Gerry Stimson (“A tale of two epidemics: drug harmreduction and tobacco harm reduction”), there is a long history of the UK and the US taking a very different stance on the concept of harm reduction relating to drug use. The UK has a long history of embracing this approach – in 1926, the Rolleston Committee advocated the prescribing of heroin and morphine (at the lowest possible dose) for hard drug addicts. However, the 1914 Harrison Narcotics Act in the US focused on tight regulation of narcotics, leaving no room for their prescription to addicts. Fast forward to the 1980’s and again the UK was at the forefront of advocating harm reduction strategies – this time via needle exchange programmes (NEPs) for injecting drug users, to prevent HIV infection. Again, the US took an absolutist approach that excluded NEPs, raising concerns that they might encourage more people to inject and discourage drug users from getting clean. Indeed, there was a ban on the use of federal money for NEPs introduced in 1989; congress voted to lift this ban in 2009 but incredibly, despite all the evidence in favour of the effectiveness of NEPs, the ban was reinstated in 2012. This ideological difference has led to deeply entrenched groups in the world of tobacco control, battling it out in scientific journals and the lay press. What I’ve been really surprised and disillusioned by is how unscientific this all is. I was always taught that science is about setting up a hypothesis and then trying to disprove it. But what we see today (mainly on the anti-harm reduction side, I would say) is studies being designed, data being cherry-picked, statistics being interpreted and communicated, specifically to further an ideological viewpoint, rather than objectively test a hypothesis. And my confidence in the peer review process (incuding of some very prestigious journals) has been severely dented. The reports from Public Health England (PHE) and the RCP stand out from this trend – they are rigorous, comprehensive, evidence based and balanced. And yet still they draw attack from the opposing camp. And this is played out in the scientific and lay media. The net result is confusion for the consumer - the smoker who is wondering whether to switch to vaping in order to improve her health. In the US, I and others (eg here and here) fear that the US vaping industry will be decimated, with the only winners being the tobacco industry. This is certainly the view of financial analysts, who are generally pretty reliable on these matters. Self-care via vaping will be driven underground, with vapers relying on a DIY black market that will grow rapidly. A tremendous opportunity to massively improve public health via self-care has been squandered. Any new hope lies in the UK, where Public Health England, the Government, the RCP and MHRA are all embracing vaping as a harm reduction opportunity. Manufacturers will be hampered by the disproportionate regulation coming from the EU Tobacco Products Directive, but compared to these FDA regulations, it will be a walk in the park. Most products will remain on the market, innovation will continue, more smokers will switch to vaping and smoking rates will continue to decline. Positions will become more entrenched, propaganda will continue, the general public will become more confused. But there is now a critical mass of vapers who will continue to tell their truth. Regulation is important but the voice of the consumer is more so. And good quality data on smoking and vaping will continue to be collected. So I remain hopeful that results from the UK will ultimately convince those currently opposed to e-cigarettes that vaping represents an effective harm reduction strategy and can offer a significant public health victory. In the meantime, the future for vapers in the US looks bleak.